Ghana captain Asamoah Gyan finally made an injury return for his side Kayserispor in their 3-2 win over Kasimpasa in the Turkish Super Lig. 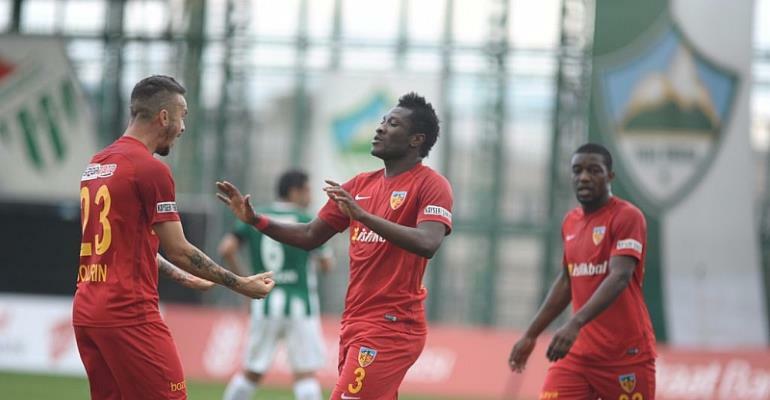 Gyan was introduced into the game in the 76th minute to replace Ukrainian international Artem Kravets when Kayserispor were already leading by 2-1. Gyan's introduction brought more sharpness in the Kayserispor attack who increased the tally to 3-1 two minutes after his introduction. Egyptian international Trezeguet reduced the tally for the visitors but it was not enough to secure even a point for them. Ghana's Bernard Mensah was on the losing side despite his wonderful performance for the visitors. The win takes Kayserisor to 5th on the table while Kasimpasa drops to 10th from 9th.